The above was published in John Lindley’s Botanical Register 11: tab. 951 (1826) as Hoya pallida Lindl., a name that has been placed into synonymy with Hoya verticillata (Vahl) G. Don. This is the only hoya I have seen in US trade that matches Vahl’s and G. Don’s type, though many different things are being circulated mislabeled as this species. (See Letter 7, below). Letter 1: “Someone asked the question in an issue of Fraterna that has been bothering us for some time. The answer doesn’t agree with what we’ve read in The Hoyan and wonder if you could clarify it?” --- Signed by several ladies --- all from California – all requested that I not reveal their identities. 1. Juan Pancho’s name has never been associated with the species from Ceram on any sales’ list that I have ever seen. I haven’t missed many. In fact, the question and the editor’s “off the top of his head” answer to the question in Fraterna is the very first time I ever heard of Juan Pancho in connection with this hoya. 2. Ted Green’s lists (dating from 1977 on) contain two species with the initials J. P. attached. One was Hoya incrassata (which TG misidentified as Hoya bordenii ) and, if my memory serves me, #81084 which was later published as Hoya burtoniae. 3. The species from Ceram was NOT introduced into US trade as 81079. The number 81079 is a number given to one of the various clones of Hoya obscura sold by Ted Green in the 1980s. 5. Peter Tsang was not a resident of Mareeba, Australia (David Liddle is). Peter Tsang lived in Brisbane, Australia. That’s quite a few miles south of Mareeba. 6. No one has ever claimed (until now) that Peter Tsang’s brother collected that species in Ceram. It was his brother-in-law that collected it (husband of Peter’s sister). It was mailed to me from Ceram when the gentleman was on a business trip there. I received it in August of 1981. Later, Peter sent a picture of his sister and brother-in-law. On the back of the picture he wrote, “This is man who sent you hoya from Ceram.” That Peter’s brother-in-law collected this one on the island of Ceram is NOT conjecture. I have it in Peter’s own hand writing on the back of that picture! Since Peter and Dexter Heuschkel were close friends, I assume that Dexter got it from the same source as I did and then planted it on his memorial garden fence. That, however, is conjecture. I know, because I have it in DK’s own, very distinctive, handwriting that DK and TG collected it from Dexter Heuschkel’s memorial garden fence, not from Juan Pancho. Later on, after receiving the cutting from Peter’s brother-in-law, Peter sent a picture of a hoya that looked very like the Ceram species. He told me that someone in Australia had found the look alike on a small Torres Strait island. I believe that the Ceram hoya is one of several clones of Hoya litoralis in circulation. It is my opinion that it is the best of them. At least one source lists this as Hoya inconspicua. There are those that consider Hoya litoralis and a couple of others to be synonyms of Hoya inconspicua. They are very close but I believe them sufficiently different to be called by two names. Letter #2: I have a hoya that I believe is some form of Hoya pubicalyx. The flower looks exactly like the picture I found on line as “fresno beauty” (sic)--- How can I tell if it is that species or another one? Reply: First off, Fresno Beauty is a cultivar. Cultivar names are always upper cased. Next, the only sure way to tell, with 100% certainty, if what you have is cv. Fresno Beauty or one of the other pink-purple, white crowned, Hoya pubicalyx cultivars is by the label on it (but only if it is the same label the breeder put on it at the time he named it).. If the label is missing, one can only guess. In distinguishing between this group of cultivars, foliage is the closest way to determine which is which (as long as we know the species is correctly identified). The closest we have to the Hoya pubicalyx species is USDA-353450, which was imported into US in 1970. This was sold in US back in the mid-1970s as “Hoya Silver Leaf.” It differed from most forms of this species in having rather broadly rounded leaf bases and slightly broader leaves. The most common one is the Hummel cultivar, ‘Pink Silver.’ It is a seedling of a plant collected in the wild by the late, Goodale Moir, of Honolulu, and given to the Hummels of California. Goodale Moir thought it was Hoya purpureo-fusca. In a short article he submitted to me, he used Hoya purpureo-fusca as an example of how plants change their appearance under different growing conditions. I sent him a copy of the picture of Hoya purpureo-fusca that accompanied the original publication in Curtis’ Botanical Magazine and a picture of ‘Pink Silver’ and asked him which of the two he considered to be Hoya purpureo-fusca. His reply was, “Yes, that is the one.” Further correspondence showed that he thought both pictures were the same and that they looked different only because of different growing conditions. He was sure of it because one of them grew in a dark corner of his garden and the other out in the open on a fence. He thought that the differences were due entirely to their individual micro-climates. He was, of course, wrong. Cultivar ‘Fresno Beauty’ was published in The Hoyan 9(4, part 2): ii (1988). Mr. Kloppenburg wrote that it was a “selfed” seedling of H. pubicalyx ‘Pink Silver.’ The only difference noted was, “different from the parent plant in that the foliage is heavily frosted with silver.” My observation is that the parent plant, ‘Pink Silver’ is more heavily frosted with silver but that the leaves of ‘Fresno Beauty’ are somewhat darker in colour, making the contrast between the silver frosting and the background greater. Even these differences are not stable. Leaf colour and the amount of frosting depend on growing conditions in all of these cultivars. I still consider ‘Pink Silver’ the most desirable of the clear sapped hoyas. Letter #3: What about the hoya that Mr. Kloppenburg published in Fraterna 16(1), 2003? It looks the same as Hoya incrassata to me? What do you think? Reply: If it quacks like a duck, waddles like a duck, looks like a duck, I’d say it is a duck. I’ve lost count but I believe this makes at least the third new name for this species that has been published by Mr. Kloppenburg. Let me see ----- there was H. crassicaulis, H. bicolor and --- I forget the other one. Then there is one he has distributed as Hoya cardiophylla, which is nothing more than just another clone of Hoya incrassata (nothing like the true Hoya cardiophylla). Letter #4 (seen on line): I ordered a Hoya lacunosa from a mailorder source and I was sent a mislabeled plant. The way I know it is mislabeled is because the leaf veins are raised above the leaf surface, giving the leaf an uneven, rather rough feeling when you rub your fingers across it. Do you know what this hoya is? Reply: Yes, I know what it is. It is Hoya lacunosa. It is those raised leaf veins that create the low spots on the leaves (little lakes), which give the species its name. You were sent a correctly labeled plant! Letter #5: This letter came in response to my telling a flower and picture contributor that the flowers and picture she contributed were not Hoya pulchella, but were, instead, flowers and pictures of Hoya microphylla. Her reply was, “I’ll ask David Liddle.” I got the distinct impression from this person that my opinion no longer counted once she had a foot in the door with David Liddle. Reply: The letter writer has not uttered a peep about the identity of this plant since her visit to David Liddle. I, however, have heard from David Liddle and he told me he’d discussed this with the lady who wrote that she’d ask David Liddle. David Liddle agrees with me. The lady’s plant is Hoya microphylla. She should rejoice! I know many people who would be tempted to trade their first born for a living cutting of Hoya microphylla. 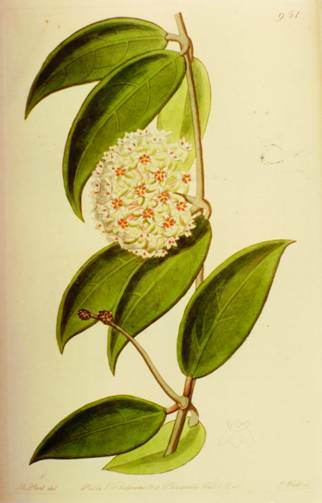 If one only reads the text of R. Schlechter’s original publication of the name Hoya pulchella, one could easily assume that the plant the lady has is Hoya pulchella, however, Schlechter (or more likely a typesetter) made a crucial error in that publication. It says that the diameter of the corolla is 2.5 cm. but, the fact is that the corolla of Hoya pulchella from 3.3 to 3.6 cm. in diameter. How do I know that? Well it’s this way: The type specimen has a flower attached. It is still attached to its pedicel. The pedicel is still attached to the peduncle. The peduncle is still attached to the plant. I had the specimen photocopied at 100% and there is a scale attached which can be used to measure the flower. Of course, there are a lot of other differences separating Hoya microphylla from Hoya pulchella. I only mentioned the most obvious one. Although we sometimes have to rely on original publications, when type material is available, the type material overrides anything said in the original or in any other description, at least that is what several degreed taxonomists and nomenclaturists have told me ---- repeatedly. 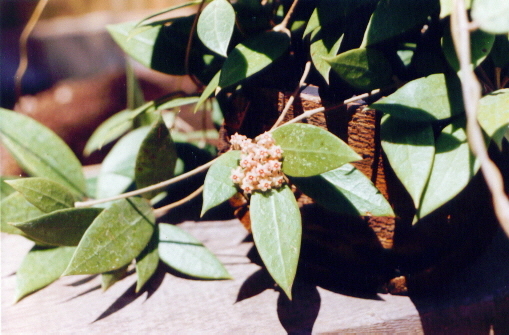 Letter #6: “ I saw a Hoya latifolia subsp. kinabuluensis C. M. Burton. I don’t know what the kinabuluensis means unless it is some kind of place name. What I want to know is WHO gave C. M. Burton the authority to name it that since Blume changed the name in 1849?” – A member of Dave’s Garden Hoya Forum. Reply: This writer did the same thing an emperor in an Aesop fable did --- she stripped herself completely naked and showed the world just how ignorant she is. #2 C. M. Burton was granted the authority to name any species of any genus anything she wants to, any time she wants to do it, by the same authority as everyone else who has ever named a plant species, i.e., by the International Code of Botanical Nomenclature. Just follow the law as found there and anyone can publish species names. Sometimes, some of us (it has happened to me) end up publishing names without intending to do so. That is because of using the right form in the right type of publication. Even when only intending to suggest, I’ve ended up having a couple of things recognized as valid publications. Up to this point, there has been no licensing board handing out permits to people, granting them permission to publish. I read somewhere that it was recently suggested but unless I was misinformed nothing became of it. I sit on the fence regarding the desirability of that. In some ways it seems like a good idea. In others ways, it seems too much like censorship. While it would be desirable to curb egotistic idiot attempts to republish every species a half dozen times in order get their own names in print, it could end up with a few egotistical permit issuers blocking legitimate publications by others so that they could publish the others’ work and claim it as their own. #3 Blume did not change the name of Hoya latifolia in 1849 or any other year. Blume never had a single word to say concerning Hoya latifolia, not in 1849 nor in any other year. For all Blume had to say about Hoya latifolia one could assume (if one were the type to assume things based on no evidence one way or the other) that Blume never heard of Hoya latifolia. Letter #7: Did you read in Fraterna that Dale Kloppenburg has announced that he will be publishing proof that all those taxonomists at Leiden University in the Netherlands and elsewhere are wrong in stating that Hoya acuta and Hoya parasitica are synonyms of Hoya verticillata? What is your opinion? Reply: I’m going to have wait and see but if he runs true to form, he’ll turn what was perfectly clear to everyone else into mud soup. I think it very funny that Mr. Kloppenburg was the first person to “go public” with the shocking news claiming that Sperlingia verticillata Vahl was the type of Hoya verticillata (Vahl) G. Don and that Hoya parasitica and Hoya acuta were synonyms of it. I get the impression that he and his other dealer cohorts operate on the theory that as long as they keep people confused, they’ll sell more plants. I made an error in this particular synonymy department once, in declaring a couple of Lindley’s things, thought to be synonyms of Hoya acuta to be Hoya pallida Lindley. After seeing pictures of the Vahl specimens, supplied to me by Dr. Veldkamp of Leiden University, I was convinced that Hoya pallida Lindley (not Dalz. & Gibs.) and Hoya lanceolata Lindley (not Wallich ex. D. Don) are Hoya verticillata (Vahl) G. Don. I am still convinced and there isn’t anything Mr. Kloppenburg can say that will convince me otherwise. I have seen only one hoya species in trade in the US which I believe is this species. It is the one that Ted Green sold, for a couple of years as H. sp. Bogor and then for many years, mislabeled as Hoya rumphii. A typical Hoya verticillata leaf. Mr. Kloppenburg distributed a long list of numbered things for many years, all of which he had labeled as various clones of Hoya acuta. Two of his most popular ones he first called Hoya acuta bronce (sic – he pronounced it bronze) and Hoya acuta green. Later on he elaborated on the latter and started calling it Hoya acuta Malaysian Green as if it were a cultivar, which it isn’t. These hoyas which he said were Hoya acuta are not and never were. It is my opinion that they are both forms of Hoya pottsii. The green form’s pollinia are very slightly longer than the pollinia on the one he calls “bronce” and on most of the others I’ve seen identified as Hoya pottsii but other than that, I see no differences. I may be wrong but I don’t think that a single difference, especially such a small one is enough to separate a plants into different species. I think Mr. Kloppenburg has made the same mistake that most beginners start out making and that is the mistake of thinking that “The Hoya I first bought was correctly labeled and that any hoya I see thereafter with the same label has to be mislabeled.” Just because Dale Kloppenburg got those hoyas labeled Hoya acuta doesn’t mean they were Hoya acuta. Their not being Hoya acuta does not mean that Hoya acuta is not a synonym for Hoya verticillata. Likewise, just because Mr. Kloppenburg thinks that the one he first saw labeled Hoya parasitica is not the same species doesn’t mean that Hoya parasitica is not a synonym for Hoya verticillata either. The fact is, I believe, that Mr. Kloppenburg has started out with a premise that has already been proved wrong. I am sure that he can prove, easily, that the hoyas he has been saying were Hoya acuta for the last 15 or so years are not Hoya verticillata but he will not be able to prove that the true Hoya acuta is not that species because it is unless everyone else who has seen the same type material and reported on it is wrong. I know where I’ll place my bets.. The hoyas sold in trade as Hoya acuta Bronce (sic – seller pronounces this as “bronze”), Hoya acuta Green and Hoya acuta Malaysian Green are both slightly varying clones of Hoya pottsii. For about 15 years, Mr. Ted Green sold Hoya verticillata mislabeled as Hoya rumphii. At a meeting in Ft. Lauderdale, FL, Mr. Green made the statement in my presence that he’d seen a Hoya rumphii type specimen and, he said, “I just don’t understand it but it doesn’t look at all like my plant.” My reply was, “Didn’t it occur to you that the reason is that your plant is not Hoya rumphii.” He turned his back on me and started a conversation with someone on his other side. That was in 1984. Mr. Green continued to sell this plant mislabeled as Hoya rumphii until 1996. In 1996 he still listed a Hoya rumphii but this time he noted, “This is not the heavy leafed plant offered before.” Prior to selling it as Hoya rumphii he sold it as Hoya sp. Bogor. Others are still distributing this species under all of these labels. It is my opinion that the only correct label for it is Hoya verticillata.